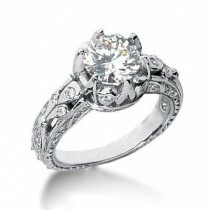 You will find antique engagement rings all across the web. Lots of people ask if they are really antiques. In most cases, they are not actually old. 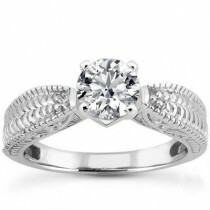 Antique rings are usually brand new settings designed with a hint of old timey fashion. All of the antique diamond engagement rings in this section are new. But what makes engagement rings antique? The style is your first indication. Many of the pieces in our collection are modeled after American designs from the 1940s. These styles are popular because they are both unique and beautiful. You will be the first to wear these fabulous settings. 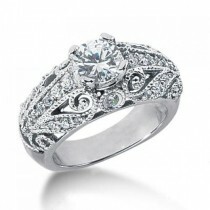 You will be surprised at how comfortable your antique style engagement ring can be. Each one is designed to accentuate the unique style and beauty of the person wearing it. Since you have the option to choose your metal type in each of these settings, you are sure to match your budget. We recommend 18K white gold for all of our settings, because your ring will shine more brilliantly beneath your diamond. You also get to choose the carat weight of your center diamond. If you want to deviate from the ordinary and make a statement with your ring, then our antique diamond engagement rings are for you. 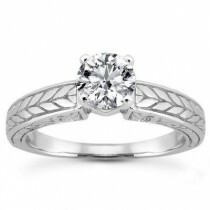 If you have something else in mind, try our custom engagement ring service. We can modify an existing design or create something completely unique just for you. You will be on your way in minutes! Just stop by the IB Custom Jewelry page to learn more.